The area around Kings Cross station is slowly being regenerated and while some will miss the area as it was before, I won’t be one of them. The grotty, run-down, whore-strewn Kings Cross of yesteryear can’t disappear fast enough. One of the highlights of the new Kings Cross is Caravan in Granary Square, a short walk north of the station. Caravan’s dining room is spartan, but spacious and airy with seriously comfy seats. Although the service is slowly improving, the key word here is ‘slowly’. Waiting 15 minutes for my order to be taken is not my idea of a good time. 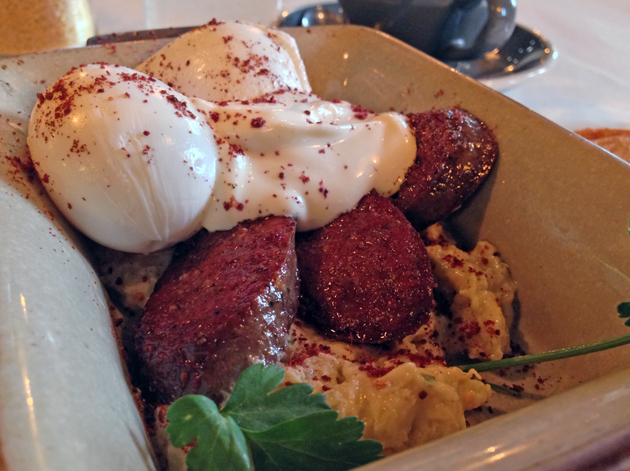 Although Caravan serves lunch and dinner as well as breakfast, my interest is in the first meal of the day as there are few other interesting breakfast options in the Kings Cross area. 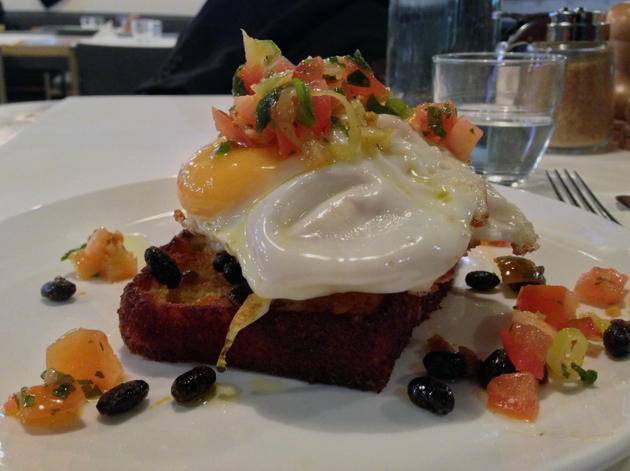 Jalapeño corn bread topped with fried eggs, black beans and peppers might sound a little overwhelming for breakfast, but it was actually a nicely balanced dish. The mildly spicy and nutty corn bread had actual corn kernels in it, while the grease-free eggs and firm, nutty beans made for a moreish topping. It may be a spin on eggs on toast, but it’s a good spin. Poached eggs on sourdough toast is a classic, but classics can be improved upon. Here, the runny eggs were joined by a coarse, creamy and flavoursome aubergine purée. This combination was complimented nicely by tart, creamy yoghurt and slices of smooth, salty beefy sausage. An excellent dish. Aubergine needs to turn up in breakfasts more often. Coconut bread with lemon curd might sound more like a dessert, and while this dish was a little sweeter than most breakfasts, it was still a savoury delight. 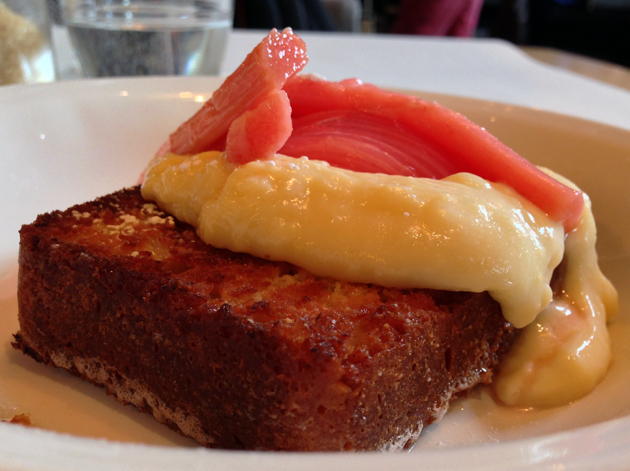 The distinctly flavoured, yet light and crumbless coconut bread was topped with a thick, creamy, sour and zesty curd. The flavour of the poached rhubarb was a little muted, but the squidgy, fleshy strands were still a good counterpart to the tart curd. A very satisfying breakfast. 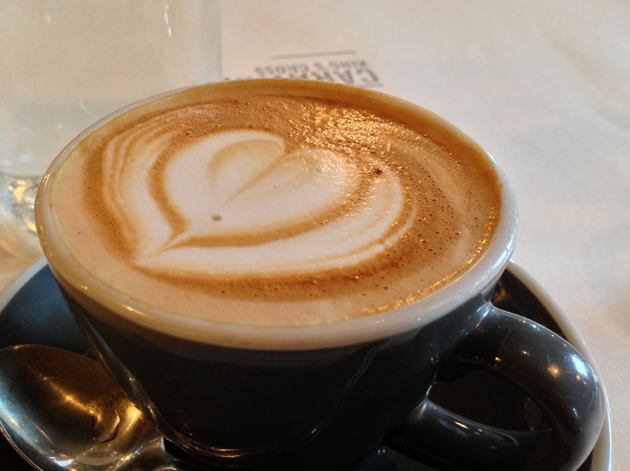 No breakfast is complete without coffee, if only because I’ll start suffering from withdrawal symptoms. I’ve had Caravan’s flat white before and it’s still just as good. The thin, smooth and silky head conceals a chocolatey, lightly smoky and strong coffee. It’s not quite the best flat white I’ve had in London, but it’s still a good ‘un. The food and coffee at Caravan is very good indeed. It’s a great breakfast spot that’s well worth visiting, even if it’s a little out of your way, despite the lethargic service. Opening Hours: Breakfast available Monday-Friday 08.00-11.30. Similar brunch menu available on weekends. Monday-Tuesday 08.00-22.30. Wednesday-Thursday 08.00-23.00. Friday 08.00-midnight. Saturday 10.00-midnight. Sunday 10.00-16.00. Total cost for one person including soft drinks: £11-15 approx. Tags: caravan, coconut, cornbread, curd, eggs, flat white, london, poached, restaurant, review, rhubarb, sausage, yogurt. Bookmark the permalink.